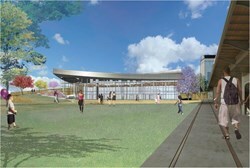 The Science of Museum of Virginia has received a $4 million gift from the Herndon Foundation to support its new community event and exhibition center. The facility will be named the Dewey Gottwald Center, in honor of the late Floyd D. Gottwald, Sr., who was the Gottwald family patriarch and chairman of Ethyl Corporation. “The Dewey Gottwald Center will strengthen the Museum’s position as a world class destination for STEM learning and community engagement,” according to Richard C. Conti, Chief Wonder Officer of the Science Museum of Virginia. Dewey Gottwald believed in the power of science to improve people’s lives and in giving back to his community. The Center will mark the legacy of a great business man and community leader. The Dewey Gottwald Center will host numerous special events and national caliber changing exhibitions. This gift is the largest private gift in the Science Museum of Virginia’s history. The Museum’s ongoing Inspire the World Campaign is transforming Virginia’s flagship for STEM learning by investing in major new exhibition galleries, statewide outreach and facility improvements. Designed by Pfeiffer Partners and BCWH, Inc, the Dewey Gottwald Center is planned to open in 2016.